790 Gothic was designed with you in mind. This beautiful mountain lodge combines complete comfort with rustic elegance to provide you with ideal accommodations for families and large groups. With six bedrooms and six baths, this three story log house has comfortable sleeping arrangements for 18 people. Whether you prefer to ski our expert slopes or cruise the blues, flyfish our streams or stroll through fields of wildflowers, or just sit by the fire and read a good book, this house is sure to renew your spirit and revitalize your body. Whatever you choose to do, a stay at The Mountain Retreat along with the majestic setting provides the perfect place to make memories that you will cherish forever. Located in Mt. 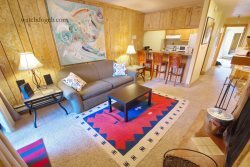 Crested Butte, the house is a 10 minute walk or 2 minute shuttle ride to the ski area. You can watch the skiers on the slopes of Crested Butte Mountain through the 40 foot high, two story wall of windows in the great room! And while sitting in the warmth of a glowing wood burning stove and sipping a warm drink, you can catch up with family and friends as well as get some rest and relaxation!